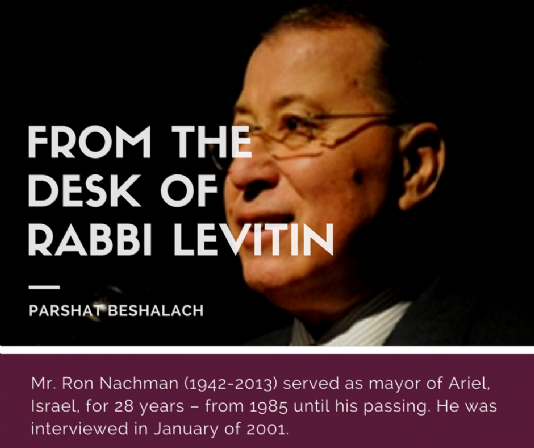 Mr. Ron Nachman (1942-2013) served as mayor of Ariel, Israel, for 28 years – from 1985 until his passing. He was interviewed in January of 2001. 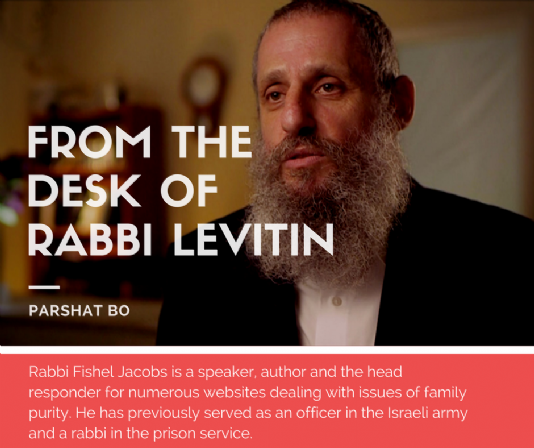 Rabbi Fishel Jacobs is a speaker, author and the head responder for numerous websites dealing with issues of family purity. He has previously served as an officer in the Israeli army and a rabbi in the prison service. He was interviewed in May of 2014. Click here for the story. 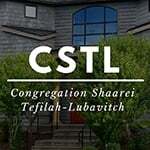 For a video of Rabbi Jacobs recounting his experience with the Rebbe, as well as a recording of his yechidus (private audience), click here . We are pleased to send you this week’s edition of Here’s My Story. 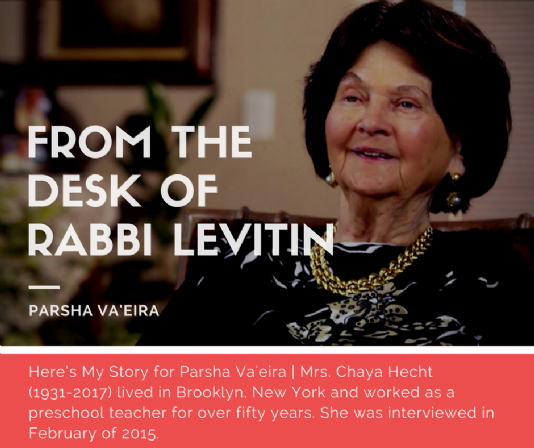 Mrs. Chaya Hecht (1931-2017) lived in Brooklyn, New York and worked as a preschool teacher for over fifty years. She was interviewed in February of 2015. But Rabbi, Are We Destined to a Life of Struggle!? It was a very stimulating group of students. I was their Tanya teacher for over a period of three years, when they were ages 14 to 17. I was a no-nonsense teacher. They had to memorize the chapters of Tanya. When I see them, even today 20 years later, I ask them to say a few lines of Tanya for me. They smile as they say a few lines from memory. These young ladies are living all over the world, serving as leaders in their communities and raising beautiful families. The reason the Rebbe decided to leave the city of Laidi was to avoid Napoleon’s advancing armies. Napoleon invaded Russia in 1812 as part of his plan to bring all of Europe under his hegemony. The Rebbe was fiercely opposed to Napoleon’s grand designs. Supporting the Czar of Russia, the Rebbe was escorted by a troop of soldiers by express order of the Czar. “…The war between the Divine and Animal Souls initially acts itself out in the heart. The Divine Soul, whose influence emerges on the right side of the heart, wants its feelings for G-d to overflow into the left side of the heart, where the Animal Soul’s emotions of self-gratification emerge. Each soul desires to saturate the heart completely. In the case of a tzadik, the Divine Soul’s goal has been achieved, and the Animal Soul has been silenced completely. But with the Beinoni, the conflict remains. At an emotional level, the beinoni is still torn between love of G-d and the desire for self-gratification, though he has achieved enough self-mastery not to allow these feelings to surface behaviorally in any way. “However, after prayer, when the expanded consciousness of the Blessed Infinite light of G-d departs, the beinoniloses the external assistance in focusing his mind and heart, and consequently the evil in the left chamber of his heart reemerges and awakens, leaving him to have a desire for the temptations of this world and its pleasures. Only since this force, in the left side of the heart, is not the only ruling power prevailing over “the small city” the negative energy is unable to bring its desire to fruition to influence the body’s parts in action or speech - or in substantive thought. From allowing his thoughts to dwell on the pleasures of this world, how to satisfy his heart’s desire. Since, inherently, in its natural capacity, the brain rules over the heart (as stated in the Zohar, portion of Pinchas 3, 224a), for that is how man is formed at birth. It was midnight, after a long day, and I stood looking at the chocolate chip cookies left out on the table (I love chocolate!). I had a tremendous urge to take a cookie. I then said to myself, “would this be a rational decision – a person my age – at midnight – chocolate?” I appealed to my rational soul (which is a whole separate discussion). I overcame the desire, walked away and felt great (I’m not always so successful against chocolate). The feelings engendered when you walk out victorious in the struggle discussed in the Tanya are profound.